And now to Biko in the Distrito Federal, where, as one opinionated observer described it, two Spaniards (Basque, to be specific) are trying, unsuccessfully, to cook Mexican food. I’m no expert on the cuisines of either of those cultures, but, based on the food we were served at Biko last October, that seems to be an inaccurate criticism. I found dishes that were undoubtedly Spanish and Basque, with a few Mexican references inserted throughout. However, I will tell you that my meal was thoroughly underwhelming. Parts of it were confusing. And the service was surprisingly cold at first, warming up to us, suspiciously, only after Adam and I were clearly marked as bloggers. Overall, it was a disappointing experience. The restaurant is an elevator ride above ground level. The interior is dark, shades of brown on a pavement of black slate. The kitchen is open to the dining room, framed by a long, narrow pass. Initially, we were offered the first table, which sat on the doorstep of traffic from the kitchen and the host stand. Every dining room has its fringe real estate, and this was Biko’s. While I’m never above being parked there, this dining room was more than half empty. So, we asked if we could move in a little further. They didn’t seem to like that request, but after checking the books, they took us all the way around to the other side of the restaurant, to a passage in the back, where we landed next to the bathrooms. While the normal diner might have found this table even less desirable than the first, we actually relished being put in a quiet, undisturbed spot. Certainly, had the restaurant been full, we wouldn’t have asked to be moved. But, the restaurant remained half empty for the rest of the night. There was plenty of space. So, I was puzzled by their reluctance to accommodate what seemed like a simple and reasonable request. And the service didn’t seem to get any more hospitable in the first half of our meal. But, enough about that. Let me turn to the food. 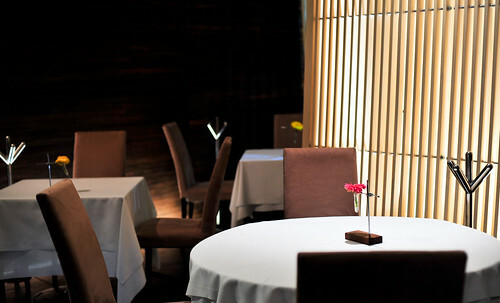 We ordered the six-course tasting menu (850 MXP, or about US$66) and added a couple of extra courses à la carte. Hibiscus, pimiento, dehydrated pineapple, almond. To see all the photos from this meal, CLICK HERE. The food ranged from delicious to not delicious. Some of it was neatly plated. Some of it was inexplicably sloppy. But, thankfully, nothing suffered from improper cooking. My favorite dishes included a fatty strip of pork jowl served with an unusually viscous tomato sauce, and a dessert of lychee and peach sorbet that was as pretty as it was refreshing. 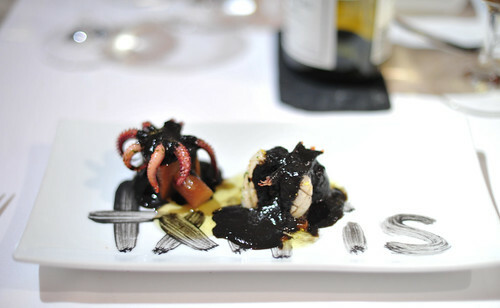 I also liked the tender “txiperones” – both tentacles and cap – that were smothered with an inky squid sauce at the table. The best part of that dish was a “cubo” of potato stuffed with jamon Iberico. That was delicious, and very Spanish. I’d describe our first course, the “Foie Gras Colorado,” as more interesting than delicious. This amorphous cloud of spongey, bread-like substance was stuffed with foie gras and dusted with a bright-red mixture of hibiscus and pimiento powder. Together, it tasted just like a pimento cheese sandwich, slightly sweet with a tart twist. I kept eating it, not out of pleasure, but because I couldn’t quite believe that it tasted the way it did. But, many of the dishes were pretty forgettable, like one with artichoke hearts, clams and toasted almonds, and another with creamy mushroom soup poured around a “quesadilla” fritter. I have no idea what was “quesadilla” about that fritter (here, the Spaniards did fail to make a convincing, Mexican culinary reference). The venison, I remember, was surprisingly soft and tender. But I can’t recall anything else about that dish, except that it was, as its name – “apiñonado” – suggested, dark in color. It was also sloppily presented, as was the “Pescado del Dia,” which sported a greasy blossom of fried salsify. I honestly couldn’t tell you anything else about that dish either, except that it was a bit heavy and looked a mess. I won’t forget the amuse bouche, though. 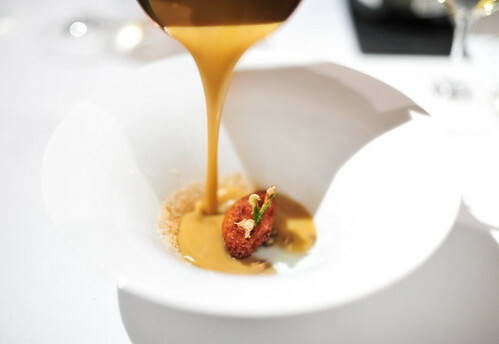 A reinterpreted salmorejo – a Spanish bread soup made with tomatoes – Biko’s version arrived as spherified orbs of creamy, tomato soup amidst crisp breadcrumbs. I loved the textures in this dish. And, I didn’t even mind that the breadcrumbs were greasy. But the tomato soup had an awful, metallic tang. Why was there a glass of warm, squash soup served with this? I don’t know, and I don’t care, because it was quite good and, more importantly it helped wash away the tinny tomato taste. The meal ended on a good note. By this point, our servers had put on smiles, those fruity sorbets had brightened our spirits, and a miniature cast-iron skillet of petits fours at the very end, tidy and good, helped pull us up from those sagging middle courses. As we waited for the elevator, we treated ourselves to a box full of Mexican candies, both familiar and foreign to me. 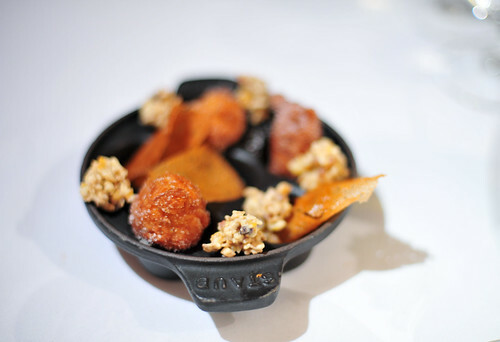 There were chewy tamarind balls, crunchy amaranth clusters, and a bracingly tart sucker coated in chile powder that had me puckering all the way home (like that foie gras dish, I kept sucking on this candy not because I liked it, but because I couldn’t believe that it tasted the way it did). For locals, that box of candies must greet them like a childhood memory, a playful and sweet ending to their meal at Biko. Even we found ourselves giddy, picking through the patches. But surveying the meal as a whole, I’m left confused. I’m not sure what happened. I may have missed some cultural references, being neither an expert on Spanish or Mexican cuisines. But chefs Bruno Oteiza’s and Mikel Alonso’s food seemed scattershot, with no sense of direction or voice. And, some of it didn’t even taste good. How has Biko found such international acclaim? It’s ranked thirty-first on the San Pellegrino World’s 50 Best Restaurant list, ahead of many other restaurants that I consider to be much better. Based on this meal, I find that laughable. Our dinner managed to lower my already low opinion of that list. Would I go back? I suppose I would. One meal is an unfair proxy. But, based on this experience, I can’t recommend Biko. ~ by ulterior epicure on February 29, 2012. Great review, I find it hard to believe that the food wasn’t great when your photos of it were, but I guess some restaurants are guilty of form over substance..